Bay Badminton Center is excited and proud to have Halim Haryanto Ho join our coaching team. BBC is excited to bring a world class caliber coach to the Bay Area. Please keep posted for his class and training schedules. Halim played for Indonesia from 1995 to 2004 with various partners before coming to the U.S. He won the 2001 International Badminton Federation World Championship as well as the 2001 All England Championship in men’s doubles with Tony Gunanwan. They also won the Malaysia (1998) and Singapore (2001) Open titles together when both played for Indonesia, and the Chinese Taopei (2005), Bitburger (2005), and United States Opens (2006) together. 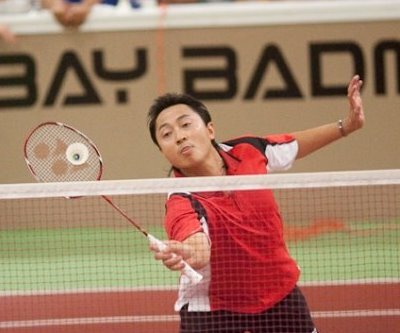 Haryanto also won the Copenhagen Masters men’s doubles with Candra Wijaya in 2003 and the United States Open mixed doubles with Peng Yu in 2008. He played on the men’s world champion Indonesian Thaomas Cup team of 2002, winning his final round match against Malaysia with Tri Kusharjanto.